'Tis the season for holiday campaigns as brands and agencies get an early start on celebrating the festivities. Cricket Wireless and agency Argonaut are modeling their holiday campaign to mimic a Hollywood movie release, though in this case, the mobile carrier's "Four for the Holidays" is an online film. The film follows four friends with holiday plans that take them across key Cricket Wireless markets in the U.S., Mexico, and Canada before realizing the best way to celebrate the holidays is spending time together. The campaign kicked off with a Friday Facebook Live interview between animated characters in the film and celebrity host Mario Lopez. The campaign will introduce movie-poster billboards “promoting” the film, as well as social teasers. TV will feature clips of the campaign, all supported across social media, including partnerships with brand ambassadors and influencers. 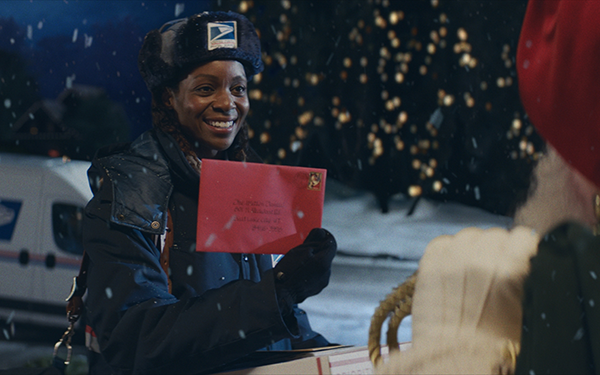 The USPS "Surprise Encounter" campaign from McCann New York continues the brand's holiday-centric messaging by depicting what happens when a USPS carrier and Santa Claus meet at the front steps of the same address and swap stories. The campaign — debuting Friday — runs on TV, print, radio, digital, social, PR, display media, mobile, and paid search. Kay Jewelers’ new effort gets personalized just in time for the chain's peak selling season, when the average jewelry chain generates about one-third of its annual revenue during the November-December holidays. The "Beam Your Love" digital experience, developed with Hill Holliday, lets people record a message at BeamYourLove.com, with the audio messages then converted into radio waves beamed into space as photons via satellite. After recording their message, senders also receive a trajectory number (much like an Amazon tracking number) as a gimmick to "check how far the message has traveled from Earth." Those who purchase rings at the store can engrave the trajectory number of his or her message onto a two-stone diamond ring from Kay’s Ever Us collection for free. This online-only campaign runs across KAY.com, as well as its social channels Facebook, Twitter and Instagram. Chex is launching its new brand platform to reintroduce the 80-year-old cereal and snack brand to a new generation. The "Holiday Possibilities" creative, developed with Pereira O’Dell New York, features a rotating array of party images, mostly holiday-themed, with the end message to visit Chex.com for easy 15-minute or fewer recipes. The effort runs cross-platform.